In TCM the term “Organ” has a much greater meaning than in Western medicine where it refers only to the same physiological organ itself. More closely corresponding European concept to the term is a functional system. For instance, in Chinese medicine Spleen is in charge of the whole digestive system that includes stomach, small intestine, colon, liver, gall bladder and pancreas (these physiological organs also gave the name to the “organs” in TCM). At the same time the role of Spleen as a physiological organ is much smaller - fine blood purification, removal of dead blood cells and platelets, processing of hemoglobin. It is described in details in the article "Twelve main meridians in Traditional Chinese Medicine". Expert extension "Meridians" estimates the energy level of these 12 systems. Red color indicates tension (syndrome of fullness), yellow - debilitation of energy (syndrome of emptiness); orange - light tension, light green - slight debilitation; green color indicates norm. In Chinese medicine energy flows from each organ to the surface of the body through the 12 main meridians. At the same time, it should be noted again that in TCM the term “Organ” does not mean a single morphological element of the body, but a functional system that is responsible for a particular task. Thus, it is necessary to use the Atlas of Meridians that allows determining a route of vital energy movement to diagnose the health state as a whole. ​How to do Meridians analysis? Specially designed expert extension allows analyzing data obtained by VedaPulse to conduct analysis most accurately and as quickly as possible. It estimates the state of the main meridians. Result of the expert extension’s work is the information about fullness of each body organ with energy: whether the amount of energy is enough; whether there is tension or so-called syndrome of fullness, or debilitation. This data can be used when prescribing different treatments, in particular, acupuncture. In this case, it will be most effective because an atlas of acupuncture points is based on knowledge of the meridians. Accordingly, acupuncture points are active zones, using them helps to optimize energy flow through meridians. This expert extension allows to objectively assess the energy level of the most important functional systems. 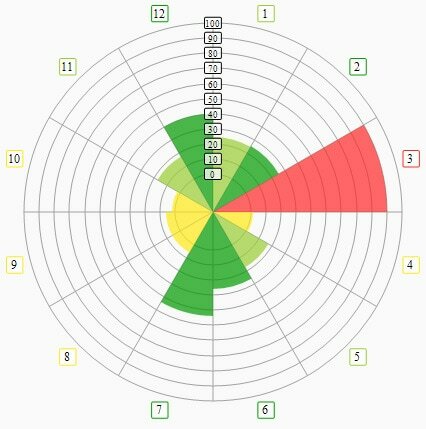 Combined with other expert extensions, for instance, module that analyzes energy of chakras, it allows to conduct a comprehensive assessment of patient’s state of health and effectiveness of treatment methods.